US House Speaker Nancy Pelosi is “deeply concerned” about human rights in Hong Kong, as well as the implementation of One Country, Two Systems, according to a delegation led by former chief secretary Anson Chan. 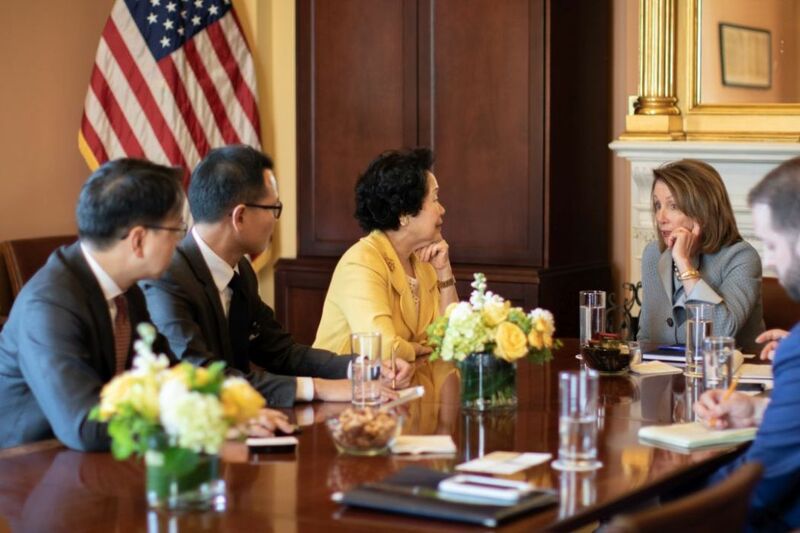 Chan, along with pro-democracy lawmakers Charles Mok and Dennis Kwok, met with Pelosi on Tuesday during a visit to Washington DC. The recent controversy surrounding a potential amendment to Hong Kong’s extradition laws was also discussed at the meeting. “[Pelosi] and numerous US politicians agreed that ‘One Country Two Systems’ in Hong Kong is under tremendous pressure, due to increasing intervention by China’s Central Government in recent years,” Kwok’s office said in a press release. Kwok’s office said that the delegation told Pelosi it was unacceptable for anyone in Hong Kong to be sent to the mainland for trial, since there is no rule of law in China. See also: Explainer: The US treats Hong Kong as a ‘separate territory’ for trade purposes, but for how long? The delegation also urged Pelosi and US politicians to continue monitoring whether the Chinese government is fulfilling its promise under the Sino-British Joint Declaration. Pelosi then said that “all political parties in the US would continue their scrutiny through the US-HK Policy Act and support Hong Kong citizens in the pursuit of democracy and genuine universal suffrage,” according to the delegation. Chan had also met with US Vice President Mike Pence last Friday, where she said she raised similar issues about One Country, Two Systems. Pence expressed concerns about rights and freedoms in Hong Kong, she told reporters. 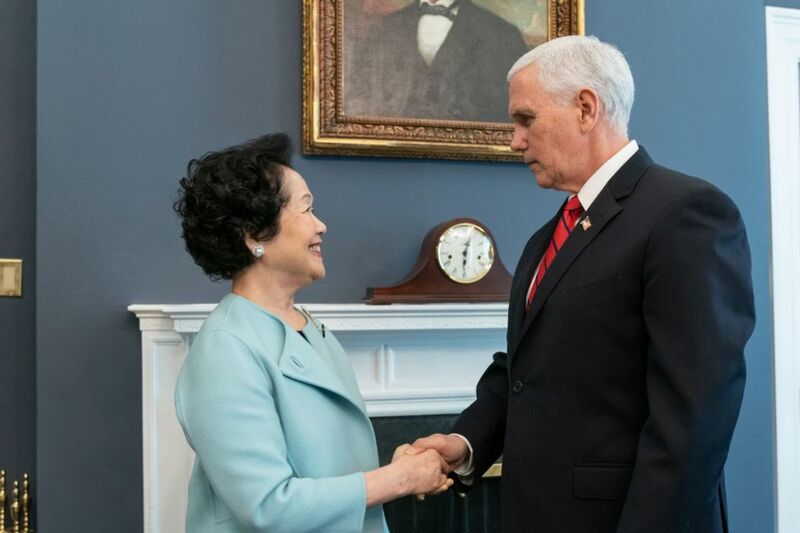 Anson Chan meeting Vice President of the United States Mike Pence. Photo: handout. At a Monday event hosted by the conservative think tank the Heritage Foundation, Chan gave a speech calling on the Hong Kong government to heed warnings about Beijing’s growing interference. 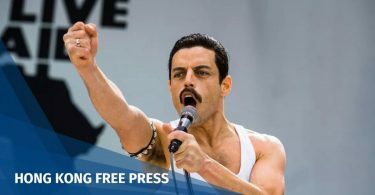 “The fact is that the withdrawal of Hong Kong’s special status under the Policy Act, even if only partially at first, would be a body-blow to Hong Kong’s economy, international standing and perceptions that One Country Two Systems remains a reality,” she said. During their stay in the American capital, the three delegation members also met with the congressional US-China Economic and Security Review Commission (USCC), members of the US National Security Council, as well as officials from the office of the US Secretary of State. Kwok revealed that members of the USCC are planning to visit Hong Kong in May. The USCC publishes an annual report on China which includes a section dedicated to Hong Kong. In its latest report, which was published in November, the USCC cited a “troubling trend” of declining freedoms and political autonomy in Hong Kong, which it attributed to interference from the central government. 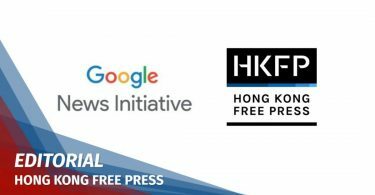 “In light of China’s increasing reach into Hong Kong, some observers argue that the territory is losing the unique characteristics and legal protections that make it important to US interests,” the report read. Charles Mok, Dennis Kwok and Anson Chan meet with Nancy Pelosi. Photo: handout. In an unprecedented move, the USCC at the time also recommended that Congress review its policy for so-called “dual-use technology,” meaning products and goods normally used for civilian purposes but which may have military applications. The state-run tabloid Global Times ran an editorial on Wednesday criticising Chan and her delegation for “appealing to their Western masters.” It said that the United States was more open to meeting with Hong Kong’s pro-democracy bloc since the country was now at odds with China. The paper added that Chan was meeting with US top leaders for show, and speculated that Pence only saw her briefly because he needed to hurry off for lunch – as shown by the clock reading 12:30pm in the background of their photo.